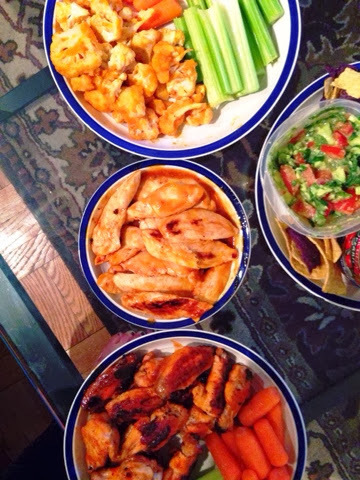 Buffalo Wings, 3 Ways is what happens when an overzealous cook last minute decided to make chicken wings for the Superbowl and in a frantic moment of indecisiveness makes not one, not two, but three kinds. I apologize that this post comes post-game day, but think of it this way: now you have next years recipe(s) 360 days early! All of these recipes are excellent. Who knew Frank's hot sauce (and a secret ingredient, which I'll get to later) could produce such, well, awesomesauce! 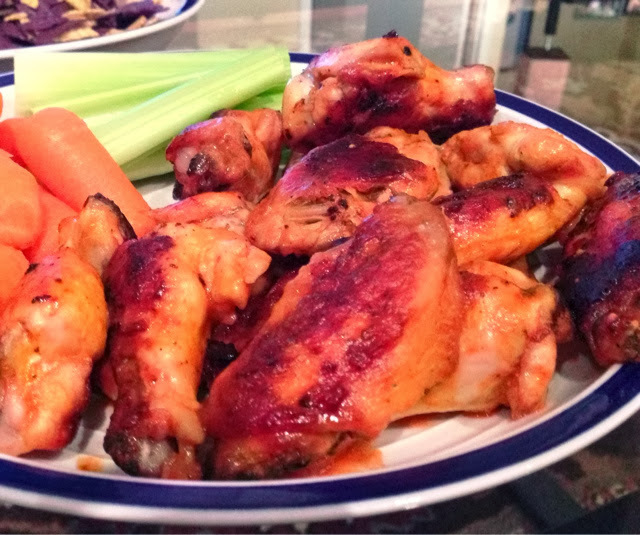 These wings are so sticky spicy tangy tasty that I might even start watching more sports just for an excuse to make them! Not really. But I could. So, what's the difference between the recipes? Well, let me clarify that they are not all technically wings. In descending order of healthy (but the last one is still a much improved version to your regular fried, butter-batter wings), I'll go through each and every bouyant, melt in your mouth buffalo bite. First up is Buffalo Cauliflower. Hold that skepticsm my friend: believe me, you will not realize these are vegetarian (and vegan and gluten-free, if desired) until you've popped at least 5 in your mouth. This recipe is a wonderful way to include vegetarians on this chicken domineered game food scene. Battered in a countryesque flour/cornmeal mix peppered with zesty spices, this coating gives the bites a substantive crunch—where they are then doused in buffalo sauce to deliver the perfect poppable punch of hot pepper. Because the flavor of hot sauce is so overpowering, the taste is really identical to buffalo wings. Next up: Buffalo Honey Chicken Skewers. Replacing dark, fatty wing meat with lean white breast meat, these tender, well, tenders are melt in your mouth succulent and juicy; sweetened with ample honey for a twist on the regular. These little guys are super easy and quick to prepare, and while the skewers are optional, they definitely rid the possibility of sticky finger licking. 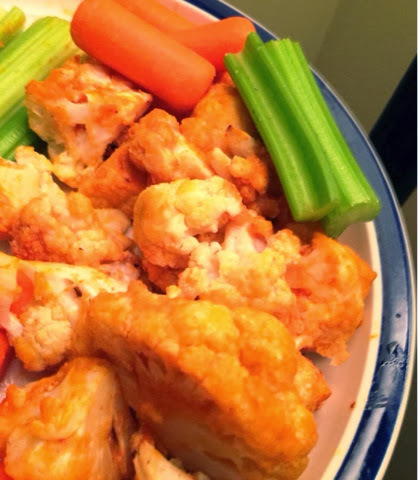 Last but not least (and most true to this post's name) is your traditional Crispy Baked Buffalo Chicken Wings. For those unwilling to budge on a the beloved classic, these guys are way healthier than the regular preparation: baked instead of fried, and substituting butter with...drumroll for my secret ingredient...almond milk! Yup, a key ingredient to each one of these "wings", almond milk delivers a fabulous healthy substitute for butter: same creamy, milky nuance; sans the bad fats. 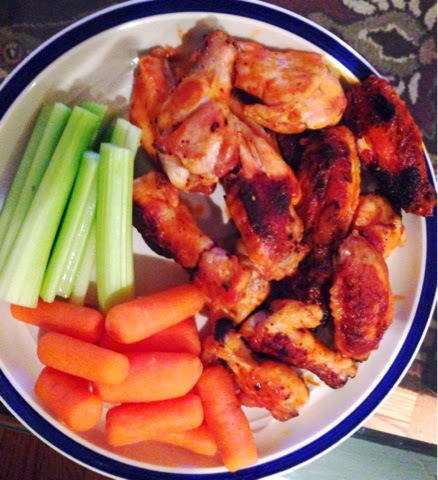 Note: Since all these recipes really "healthy-up" the classic buffalo wing, make sure to serve each recipe with ample carrot and celery sticks. On the side, choose a blue cheese dip of your liking. Preheat oven to 450 degrees F. Line a baking sheet with foil or parchment paper and coat with olive oil spritzer or 2-3 tbsp olive oil. 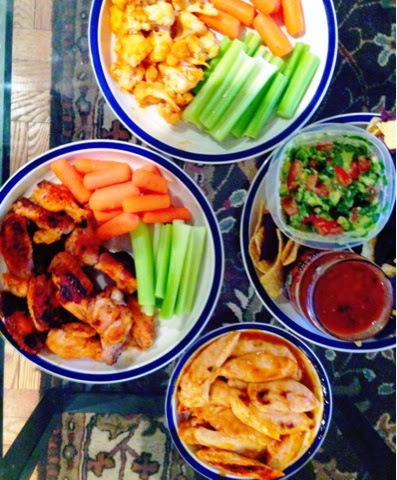 Assemble buffalo sauce: combine 1 tablespoon almond milk, hot sauce, and apple cider vinegar in a small bowl. Set aside. Assemble batter: mix flour, cornmeal, 1/4 cup almond milk, water, spices, and dash of salt and pepper into a small bowl. Dip each cauliflower floret into the batter, adding more water if you prefer a thinner batter. Lay coated florets on baking sheet in an even layer. Bake for 25 minutes or until golden brown. Then, pour buffalo sauce mixture over the bites, stirring so each cauliflower floret is coated in the sauce. Bake for another 10-15 minutes. Serve with carrot and celery sticks, and blue cheese dip of your liking. 1. If using skewers, soak skewers in water 15 minutes. Heat broiler; coat a broiler pan (or baking pan with foil) with 2 tablespoons olive oil or olive oil mist. In a bowl, stir cornstarch into 1 tablespoon hot sauce until smooth; stir in remaining hot sauce, almond milk, vinegar, honey, cayenne (optional), and dash of salt and pepper. Add chicken; toss to coat. 2. Thread chicken lengthwise on skewers; reserve remaining hot sauce mixture. Place chicken in pan so skewers hang off edge; cover exposed sticks with aluminum foil. (If not using skewers, place directly onto broiler pan or foil.) Broil for 4 minutes. Turn chicken; brush generously with remaining sauce. 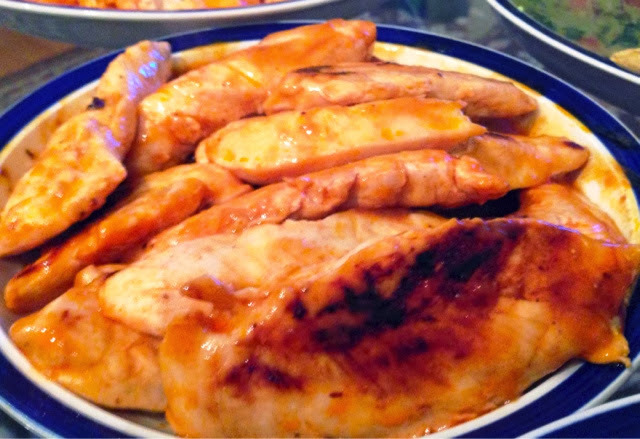 Broil until chicken is cooked through, 4 to 5 minutes. Serve with vegetable sticks and blue cheese dipping sauce. 1. Make buffalo sauce by mixing together all six ingredients in a small bowl, set aside. 2. Preheat oven to 400°F. Line a large rimmed baking sheets with foil. Mix together wings, olive oil, and salt and pepper; spread out in a single layer on baking sheet. 3. Bake wings for 30 minutes. 4. Remove wings, brush each side generously with buffalo sauce (reserve the leftover), and increase temperature to 450°F. Bake for 15 minutes more, until cooked through and skin is crispy. 5. Toss finished wings in remaining buffalo sauce. Serve immediately. 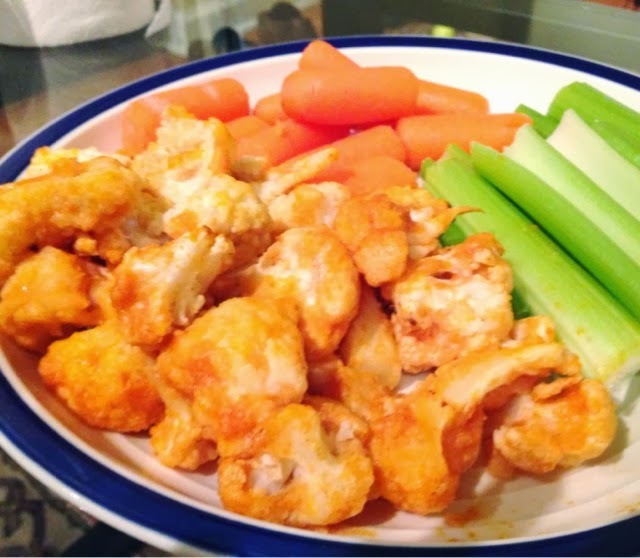 I made the buffalo cauliflower bites as my contribution to the Super Bowl party I attended last night and they were a hit! Crispy on the outside and warm on the inside, they paired perfectly with a thick blue cheese dressing. I would definitely make these again - perfect as a vegetarian contribution to a pot luck style gathering!